Dublin is the capital and largest city in Ireland. Although Dublin is a large city, it has a feel of quaintness throughout. You’ll enjoy walks down scenic cobblestone streets and along the River Liffey. Dublin has so much history to explore between its castles, cathedrals, and museums. The city is also full of culture. While visiting Dublin, you can enjoy its art, music, restaurants, and world-famous pub scene. Outside of the city centre, Ireland is made up of some of the most incredible nature you could imagine. Within easy access of Dublin, there are several day trips you could do to take in the beauty of Ireland. 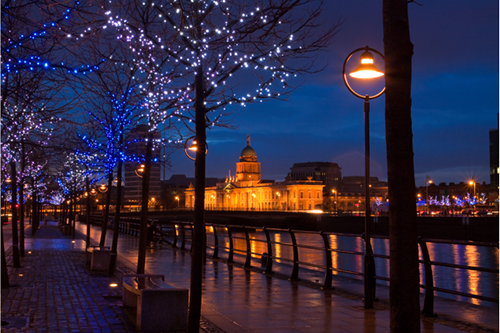 Plan your Dublin holiday with Webjet to save yourself both time and money on your booking. Webjet’s Dublin holiday packages bundle together flights and hotels to help you get the best deals. Holidays to Dublin can typically get expensive, but with Dublin accommodation and flight packages, you can save hundreds of dollars on your Dublin travel expenses. Spending less on your hotel and flights means you’ll have more to spend on activities and excursions to enjoy in Ireland. Dublin packages are a great option for families planning a trip to the gorgeous country of Ireland. There is one airport in Dublin where you will arrive from Australia. Dublin Airport (DUB) is the main airport in Ireland, receiving flights from all over the globe. The airport is located 10 kilometres (6 miles) north of the city centre and offers several transport options to reach your hotel. Flying from Australia, there are a large variety of airlines you can fly with to Dublin. These include Qantas, Virgin Australia, British Airways, Emirates, Singapore Airlines, and Lufthansa. All flights from Australia include at least one stopover on the way to Ireland. If you are travelling from Perth, you will arrive to Dublin in about 20 hours. From the east coast of Australia, you can expect to reach Dublin in less than 24 hours. Throughout the Dublin city centre, you’ll find a large number of hotels to choose from. Prices range from backpacker-friendly to luxurious. Dublin is a compact and easily walkable city. No matter where you stay in the city centre, you’ll be within easy access to some of the city’s top attractions. The Belvedere Hotel is centrally located in Dublin within walking distance of all the top attractions. Within the hotel, there are 101 guest rooms that are large enough to accommodate a family. Rooms are comfortable and offer a homely atmosphere. A special experience to have at the Belvedere Hotel is its Irish night, where you can enjoy food and drinks while experiencing traditional Irish music and dancing. For a budget-friendly option in the city centre, the Academy Plaza Hotel is a great option. While the hotel is an affordable option, it offers a comfortable and stylish experience. Rooms combine modern style with some touches of traditional Irish charm. Guests of the Academy Plaza Hotel can enjoy complimentary breakfast, a fitness centre, and a restaurant. From the hotel, you are in the perfect location to reach all of the top attractions in central Dublin. The Fleet is a chic hotel located on Dublin’s popular street Temple Bar. While the street is known for its nightlife, the Fleet is at the end of Temple Bar where you can enjoy some quiet while being just steps away from the excitement. Rooms are available in a variety of sizes and prices. The hotel is elegantly designed throughout and serves as the perfect home-base for your adventures around Dublin. Guests of the hotel have access to a restaurant, bar, and free WiFi. Dublin is known around the world for its history, vibrant pub scene, and friendly locals. The city centre of Dublin is as quaint as it gets with its cobblestone streets and the scenic River Liffey. Throughout Dublin, you’ll experience lots of beautiful architecture, museums, and cathedrals that will have you falling in love with Ireland right from the start. For centuries, Ireland was ruled over by Britain. Dublin Castle was the official seat of British rule in Ireland from 1204 until 1922. Today, the castle is still in use regularly. Irish presidents hold events and inauguration ceremonies at the castle. Dublin Castle is open to visitors and is a great opportunity to learn more about the history of the city. In the castle, you can see a number of exhibits as well as the state apartments. One of the most famous beers in the world originated in Dublin in 1759. In the city, you can visit the Guinness Storehouse to learn all about their brewing process. A tour of the Storehouse will teach you the history of the beer and the art of pouring the perfect pint of Guinness. After your tour, enjoy a pint of the indulgent beer on the top floor of the Storehouse overlooking the city. Tickets to visit the Guinness Storehouse cost €18.50 ($30 AUD). This world-famous university was founded in 1592 by Queen Elizabeth I. Over the years, the university has been attended by several Irish presidents as well as Samuel Beckett and Oscar Wilde. Visitors to Trinity College can enjoy a walk through the beautiful campus and then pay a visit to the college’s Old Library. In the library, you can view the Book of Kells, which is the oldest book in the world. The Book of Kells includes a collection of gospels and elaborate illustrations that was created around 800 AD. Tickets to visit the Old Library cost €11 ($17.70 AUD) for students, €14 ($22.50 AUD) for adults, and €28 ($45 AUD) for a family of four.